Between 1750 and 1850 the British landscape was transformed by a transport revolution which involved engineering works on a scale not seen in Europe since Roman times. While the economic background of the canal and railway ages are relatively well known and many histories have been written about the locomotives which ran on the railways, relatively little has been published on how the engineering works themselves were made possible. 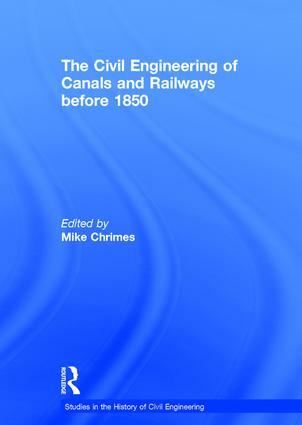 This book brings together a series of papers which seek to answer the questions of how canals and railways were built, how the engineers responsible organised the works, how they were designed and what the role of the contractors was in the process. Contents: Introduction; Part One: Canals: Canals and river navigations before 1750, A.W. Skempton; The Waltham pound lock, K.R. Fairclough; Rivers and canals, C. Hadfield; The construction of the Huddersfield narrow canal, 1794-1811: with particular reference to Standedge tunnel, R.B. Schofield; John Pinkerton and the Birmingham canals, S.R. Broadbridge; Managerial organisation on the Caledonian canal, 1803-1822, A. Penfold; Along the water: the genius and the theory. D'Alembert, Condorcet and Bossut and the Picardy canal controversy, P. Redondi; Poverty, distress and disease: labour and the construction of the Rideau canal,1826-1832, W.N.T. Wylie; Hugh McIntosh (1768-1840) national contractor, M.M. Chrimes; Part Two: Railways: Some railway facts and fallacies, C.E. Lee; The Influence of landowners on route selection, F.A. Sharman; England's first rails: a reconsideration, R.S. Smith; The Butterley Company and railway construction, 1790-1830, P.J. Riden; Cast iron edge-rails at Walker colliery, 1798, A.W. Skempton and A. Andrews; Embankments and cuttings on the early railways, A.W. Skempton; The railway navvy - a reassessment, D. Brooke; Railway contractors and the finance of railway development in Britain, H. Pollins; The origin of American railroad technology, 1825-1840, D.H. Stapleton; Tracks and timber, J.H. White; Index.